the CORPUS Blog: Does religion do more harm than good? Political violence fuelled by religious zealotry increasingly threatens the world’s peace and sanity. Is religion inherently toxic? Or could it simply be that there is good religion and there is bad religion, and we just need to learn to tell the difference? The meaning of “religion” is hard to encapsulate. It would include rites in the ancient world, such as animal and human sacrifice, employed as forms of scapegoating. But I am here concerned with global faiths that have produced major bodies of critical thought, and with definitions given by the sociology of religion, which sees its subject as involving an apprehension and symbolic representation of sacred or non-ordinary reality. Human beings do not merely investigate the natural world at a scientific level. We also seek to make sense of our lives via all sorts of evolutionary adaptations – agriculture, dance, literature – that have emerged from animal play, animal empathy, ritual and myth during a long history of tribal societies without much sense of the beyond, through supernatural king-god monarchies, to more recent societies with their religions of value transcending the brute givens of existence. With this trajectory in mind, we might point up developments during the first millennium BCE. Whether or not one accepts the term “Axial Age” to encompass this period, it can nevertheless be described as transformational. The ideal was contrasted with the real; visionary horizons of hope were set against the frustrations of the everyday world. Though expressed in different idioms across the world, the quest for transcendence – a higher dimension of reality embodying more exalted values – arose in China, through reflection on the way of nature; in India, through worldly renunciation; in Israel, through prophetic denunciation; and in Greece, through theoretical reflection and the quest for wisdom. Critics (including those who would kick away the apparently superfluous spiritual ladders that have raised us to the branches we now perch on) may nevertheless remain unmoved by these points, for at least two sorts of reason. The first is practical. Context matters, they may say, but so does the big picture. To wit: harmony between the major religions remains a remote goal; the destabilising effects of Islamist extremism especially can be seen far from the Middle East or Ground Zero in New York. The recent, much-noted “return of religion” across societies including Egypt, Turkey and India (a sharp reaction against secularising drives in these countries several generations ago) supplies fresh grounds for disquiet. Formerly secular challenges such as the confrontation between Israel and the Palestinians have taken on an overtly religious cast; religion has played a role in recent and continuing civil wars from Sri Lanka to Chechnya to Sudan. Along or near the tenth parallel of latitude north of the equator, between Nigeria and Indonesia and the Philippines, religious fervour and political unrest are reinforcing each other. Several countries have seen the rise of highly divisive faith-based political groups, whether violent or not. They include Vishwa Hindu Parishad in India (which sowed the seeds of the Hindu nationalism reaped by the BJP during the 1990s), the Muslim Brother­hood in Egypt and Jordan, Hamas in the Palestinian territories, Hezbollah in Leb­anon, the Nahdlatul Ulama in Indonesia, and the Zionist Christian movement in the United States, which supports illegal Israeli settlements in the West Bank. But are these prosecution arguments so much stronger than those voiced by the defence? I am not just referring to the obvious point that religion is (whatever else it may be) the world’s greatest source of social capital, or that faith-based conviction has mobilised millions of people to oppose authoritarian regimes, inaugurate democratic transitions, support human rights, and relieve human suffering. I am also talking about the painstaking sociological analysis which disentangles the causes of a given conflict – demonstrating, for example, how often faith is politicised, and thus how the notionally “religious” roots of a given conflict are often really social problems in disguise. This insight applies much more widely. The romantic nationalism underlying so much conflict over the past 200 years derives from history, ethnicity and linguistic differences, as well as from religion. Singling out faith-based motivation for acts of violence is irrational, because weapons are used in the name of an alleged greater good all the time. Islamist suicide bombers have learnt their deadly craft from secular exemplars. The roots of contemporary terrorism lie more in radical ideologies like Leninism, incubated in the West, than in religion. Across other parts of the world, faith allegiances often shade into ethnic divides, which in turn merge with claims to land, water and oil. Or consider the examples of the Balkans and the Caucasus, where religion can exacerbate differences that are fundamentally political. This theme cries out to be placed in the broader context of nineteenth-century and post-colonial nationalism. For example, numerous Christian subjects of the Ottoman sultan thirsted for independence and a freer expression of their culture. But their chief inspirations were Napoleon and the nationalist movements he spearheaded. We can thus find many examples of conflicts in which adherents of the same faith are enemies, just as other cases where two religions can be aligned together. It is telling that Raymond Aron’s classic study Peace and War scarcely mentions religion at all. 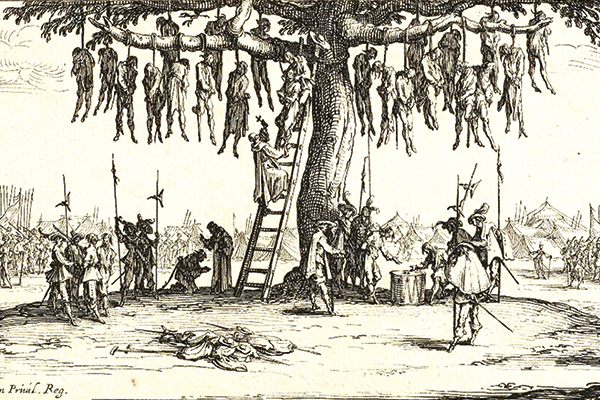 The Crusades and the Thirty Years War (1618–48) are naturally central exhibits in any debate about religion and violence. But far more attention should be paid to the rise of the nation state and the homogenising force exerted on often unwilling populations by politically driven nationalist rulers. In his book The Myth of Religious Violence, William T. Cavanaugh cites Charles Tilly’s remark that “war made the state and the state made war”. He also quotes Gabriel Ardant to the effect that in the process of state-building, the most serious source of violence – and the greatest spur to the growth of the state – was the attempt to collect taxes from an unwilling populace. Violence also sprang from the resistance of local elites to the centralising efforts of monarchs. No wonder co-religionists might find themselves on opposite sides of political divides. The factors rehearsed in the past few paragraphs ought to unsettle at least part of the story told by hard-line secularists. Karen Armstrong rightly protests against a certain cast of mind when she notes that all sorts and conditions of people (“American commentators and psychiatrists, London taxi drivers and Oxford academics”) blame undifferentiated “religion” for all the major wars in history. While important, however, the counter-arguments do not necessarily defeat the secularists, because of a second – theoretical – rejection of religion, which underlies their first – empirical – one. Many cannot accept an analogy between religion and other forms of kinship bond. In their eyes, tribe, ethnicity, language and so on all at least boil down to something real – unlike religion, which only trades in dangerous falsehoods. That is why we have an issue in the first place. Take a more tangible comparison. There is plenty of scope for grown-up disagreement over the pros and cons of veganism. But there is no serious discussion to be had about the alleged benefits of crack cocaine. Readers of Gibbon will recall his remark about how sacred rituals were viewed in the Roman Empire: as true by the ignorant masses, as false by the philosophers and, by the magistrates, as a convenient means of social control. Gibbon’s successors can thus be forgiven for thinking that when men and women come of age they outgrow the fantasies of yesteryear, whether or not religion’s role in fomenting conflict is exaggerated. These thoughts propel us onto philosophical terrain. If you believe atheism to be true, then you are of course likely to conclude that religion is inherently bogus (no matter how much good done in its name by default). There are historical questions relevant to our theme that need airing, including how much this or that faith has encouraged widely recognised goods such as scientific enquiry or freedom of conscience or democracy and the rule of law. Are religious believers – Christians especially – disingenuous to claim credit for providing the theoretical ecosystems apparently needed for advances that would (according to religion’s opponents) have occurred anyway? Conversely, are opponents of religion wrong-headed in failing to see that so much of what they think of as common sense available to “neutral” reason actually rests on unacknowledged theological foundations? This factor applies to many scientific developments as much as to landmark documents from Magna Carta (anchored in biblical norms) to Milton’s Areopagitica to the UN Declaration of Human Rights, which was largely crafted by Christians. Copernicus, Descartes, Leibniz, Newton and other authors of the scientific revolution were not just passive products of a Christian culture, but serious believers with theological expertise to match their commitments to mathematics and physics. As indicated, though, such issues are logically preceded by a deeper question, namely, whether religious belief has a rational basis in the first place. Hard-headed thinking is certainly called for. But our enquiry should note the limits of wholly disengaged analysis. In other words, we must also attend to how faith is mapped from within. Having conceded an important point to the anti-religion camp, we should in fairness make an equally important concession to the other side. The nutritional analogy remains useful up to a point. While vegans are not the only people entitled to voice opinions about the merits of their diet, they do possess a special warrant for commenting on what it feels like to avoid all animal products – especially if they speak with the benefit of some scientific knowledge. Note, too, where this comparison breaks down. In a debate for and against veganism, all informed participants will at least agree over what it is they disagree about. Yet it is because thoughtful believers often do not recognise the models of religion regularly peddled by secularists that we cannot even begin our main discussion without substantial ground-clearing. For example, people of faith regularly insist that the deity rejected by Richard Dawkins is more of an inflated creature than the God of classical theism. The psychologist Oliver Sacks, raised in an Orthodox Jewish household, lost his faith as a schoolboy after a prayer experiment. He planted two rows of radishes, cursing one and blessing the other, before concluding that religion was a sham when both grew equally well. Did this disprove the existence of God, or merely discredit the simplistic claims Sacks had been taught? Atheists can plainly score cheap rhetorical victories by lampooning the ignorance or charlatanism of certain believers, just as some people might dismiss veganism out of hand because certain vegans are malnourished, or others might avoid swimming entirely on the basis that it carries a risk of drowning. But to win an argument convincingly, you need the backbone to confront a robust version of the contrary position. In our case, this means that it is essential to probe stronger arguments for faith, and the patterns of life to which thoughtful as well as hot-headed believers are rightly or wrongly committing themselves. This is hardly to draw premature conclusions. It is simply a bid to match our tools to the task in hand. After all, would anyone take seriously a discussion of whether socialism does more harm than good by ignoring Western Europe and instead focusing only on Cuba and the Khmer Rouge? Rupert Shortt is religion editor of The Times Literary Supplement. His new book, Does Religion Do More Harm than Good? is published by SPCK at £9.99 (Tablet price, £9).